Provides a Significant Level of Security at a Great Price! A case contains 1,250 sets of two sheets, packaged in 250 set (500 Sheet) reams. 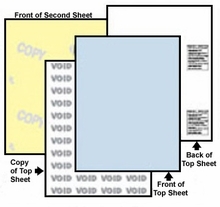 The Top or First Sheet is Blue Security Paper. The Second Sheet is Canary NCR Carbonless Copy Paper without Security Features. The second sheet can be printed like the first sheet, and Signatures or other Impact or Pressure Marking will go through to the second part. And we don't ignore the Environment! 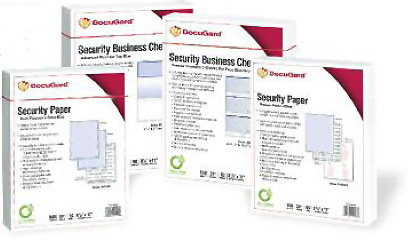 DocuGard® Papers are made by Paris Business Forms--A leader in the Sustainable Forest Initiative.